I first wrote about North Korea's caged population in 2013, where I showed the fences that surround the country. Since then, I have been able to map the full system of fences, guard posts, and gates. And since the general situation regarding population movement has changed since then as well, I want to revisit the topic and also provide you with the Google Earth file so you, too, can explore the miles of fences and blocked off beaches, as well as to provide added evidence of the horrific human rights situation that exists. If you're primarily interested in getting the KMZ file, click here. First, a quick refresher. Much of North Korea's coastline and land borders are fenced off. According to multiple defector and media reports, some portions of fence are electrified while others are simply guarded by police. Of course the southern border (aka, the Demilitarized Zone/DMZ) has been turned into, perhaps, the most impenetrable 820,210 feet (155 miles) of border in the world. Ever. Apart from the hundreds of thousands of troops stationed along the DMZ, it has over 1,000 observation towers and forward military posts. Finally, the border with China (and the small section with Russia) is protected by large reservoirs, rivers, and in many places, fencing as well. The purpose of these barriers is to keep people inside the country. Construction was sped up during the famine as the regime tried to cope with the mass movements of people, risks of defectors stealing boats, and as the government struggled to maintain their control in all sectors of society. All of this means North Korea's population really is caged. A more colorful description of the country would be as an open-air prison. The following images show the extent of the national fence system. Click on images for an enlarged view. I was able to map nearly 1,400 miles (1,399.36 to be exact) of fencing. There are lots of small coastline sections where the paths of fencing can still be seen, but the fence itself is gone - likely pillaged for scrap metal by locals, however, most of the gaps you can see (and all of the large ones) are due to either natural barriers or where direct access to the sea/border is blocked by an industrial site, military base, or other construction that serves as a barrier. Many coastal towns and villages lack a fence and instead the coastal portion is lined with dockyards and factories which requires locals to go through any number of gates or checkpoints, if they're permitted through at all. I've tried to map as many gate houses as possible that provide direct access to the coast. Ones that simply allow access to a factory or other site adjacent to the sea are not marked. This next image shows the reason for each of the major gaps in the fence system. This image shows 837 identifiable police border guard posts and 434 stand-alone watchtowers along the the DMZ. Under Kim Jong Un, miles of new fencing have been erected as well as older fencing upgraded in certain areas. A large number of additional watchtowers have been added along the fence routes as well, particularly in the northern regions. However, border controls extend well beyond fences and watchtowers. Cell phone single jamming towers, cameras, and other surveillance equipment have been deployed along both borders, but efforts have particularly increased along the Chinese border (which is the route most defectors take). A related issue is the increased border protections China has been implementing. 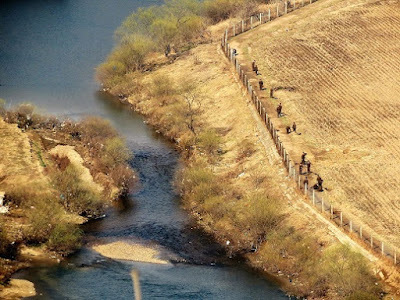 As with North Korea, China has begun to build fences (of a far greater quality than the DPRK) along certain key border sections to stem the flow of defectors. They have also constructed signal jamming towers and increased police and military patrols. China's active attempts to catch defectors by checking train stations, setting up road blocks, and patrolling neighborhoods, occur not only in the immediate border region, but far into the interior in major cities like Jilin. The following series of images clearly show the individual fence posts and come from different parts of North Korea. Additional images can also be found in the original 2013 post, A Caged Population. As both Kim Jong Un and China have taken a much harder line regarding border security, there has been a real and measurable effect on the numbers of successful defections. In 2017 there were 1,127 defectors who made it to South Korea, which is a decline of 27% from 2016. That was the lowest figure since 2001. The total number of defectors peaked around 3,000 in 2009, meaning there has been a decline of ~62% overall. Despite the barbed wire fences, guards with automatic weapons, the high risk of women being sold into sexual slavery, and the risks of repatriation and imprisonment (or execution), people still brave the cold waters of the Yalu River and the forests of northern China to find their way to a better life. Even soldiers posted along the DMZ, who tend to belong to elite families and are generally more well off than soldiers stationed elsewhere, accept getting shot at 40 times (or even kill other DPRK soldiers) to cross into South Korea. Kim Jong Un may have been successful in curbing overall defections, but the drive to feed one's family and the desire to experience the freedoms of the outside world (that North Koreans are increasingly being exposed to) will continue to inspire and embolden people to take the risks and seek a better life.